Florida Country Living that fits like a warm, comfortable, glove. 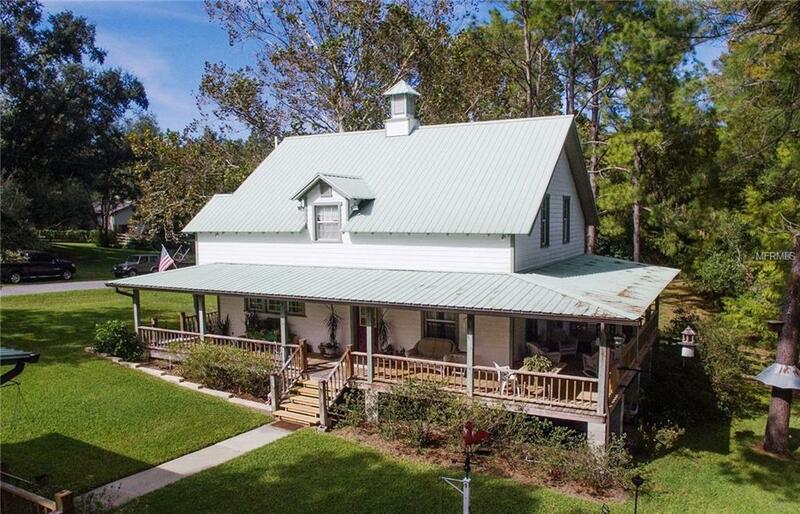 Sitting astride the serene natural setting of Wolfbranch Creek, this truly unique property offers the casual country lifestyle sought by many but so elusive in todays Florida. Minutes from downtown Mt. Dora w/ its unique shops, fabulous dining, & constant parade of exciting events, this secluded neighborhood is hidden just the right distance from the wealth of dining & shopping along the "OBT in Lake Cty. Soaring ceilings above the Great Room w/ its cozy fireplace & views to the rear porch & Creek through French Doors; the warm oak floors & built-ins urge you to "set n relax to take in the remarkable natural setting. The adjacent dining room easily accommodates a large table for extended family and the bright & airy kitchen w/ generous, warm, honey toned cabinetry provide a convenient setting for easy preparation of meals from simple to entertaining elegant. Upstairs, the Master Suite & Loft, open to the living area below, features a comfortable bath w/ claw-foot soaking tub, dual sinks, & spacious walk-in closet. Near the end of a Cul-de-sac, this home with its Barn and A/C dry rooms offers extensive opportunities to modify all that extra space to fit your own personal needs: a contemplative studio perched above the creek, a bonus room for out-of-towners, or just a very special craft or theme room. With a little imagination & planning, unlimited opportunities await your initiatives at this extraordinary property, all with NO- HOA!